Export Portal's Parts and Equipments Department features a wide selection of aircraft parts, helicopter parts, sailboat parts, snowmobile parts, ATV parts, car parts, motorcycle parts, truck parts and even more. Buy online motorcycle parts for your bike's body, motor, drive train or braking system. Find performance and replacement exhaust systems,pistons rings, cams or gaskets to refresh your engine from the ground up. Check out our great deals on popular brands like Hot Cams , Wiseco, Hot Rods, S&S, Bike Master, Namura and more. Protective gear and Motorcycle helmets are also popular products at Parts and Equipments Online Store. Choose from a great selection of motorcycle pants, motorcycle jackets or motorcycle gloves and many other motorcycle parts and accessories to match your new gear. 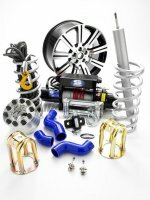 Or if you are interested in buying car parts online discover our huge directory of automotive products from performance parts and car care to tools and equipment for cars, trucks, snowmobiles, RVs, ATVs and more. Browse our online store and discover auto parts online that will make your driving experience safe and your trip less stressful during winter or bad weather. Find parts and accessories you need for your RV, snowmobile, PWC, or commercial truck by trusted name brands. Even better, Export Portal's Parts and Equipments Online Store lets you shop online from any country of the world from the comfort of your home, office or garage.